At Overhead Door Company of Akron, we have trained and certified fire door technicians in Cleveland, Akron, and Canton to perform fire door testing according to NFPA 80 regulations. Effective in 2007, the National Fire Protection Association (NFPA) requires building owners to have their rolling and sliding fire doors to be inspected and tested annually. Overhead Door Company of Akron provides a documented inspection and a corrective action plan for issues found during the course of the inspection. We will provide a visual inspection, an operational inspection, and a drop test. All tests are to be witnessed by a representative from your company. Any deficiencies found during the inspection will documented. 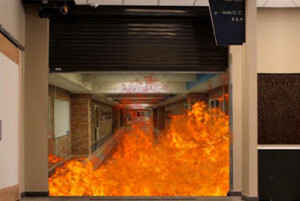 In addition to testing, Overhead Door Company of Akron will perform Repair-Service Work to correct issues in order for the Fire Doors to perform up to their manufactures standards in the event of a fire. Please give us a call today to set up an appointment to have your fire doors tested or to request a quote @ 1-800-875-6789.